Laura and I enjoyed a wonderful visit with my parents last week. 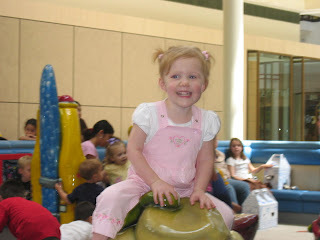 We went to the mall and played on the indoor play equipment. 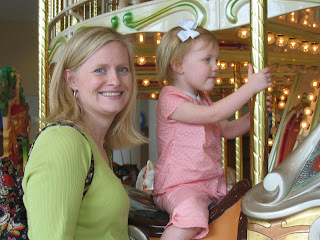 Laura especially enjoyed the carousel ride. 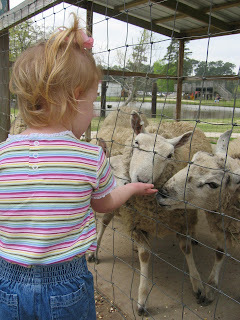 We visited Old MacDonald's Farm where Laura got to pet and feed all kinds of animals. I was a bit paranoid about all the germs these animals posed, but we seemed to survive! 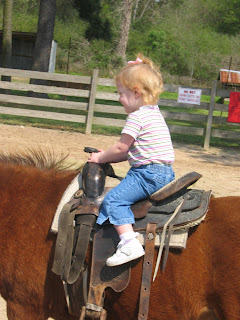 She even got to ride a pony. 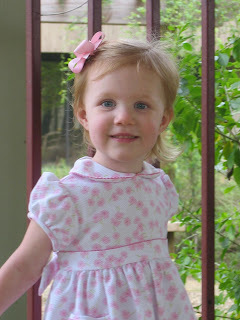 After church on Sunday, we went to a gazebo where I got some nice shots of Laura. It was a fun visit for all of us. Laura loves Meme and Don-Don and is still talking about them - wondering where they are. I am sure the dogs, Hank and Gabby, are glad she has left because she was pretty good at terrorizing them. In fact, one morning I found Laura riding Hank like a horse! We enjoyed having Jim with us last week, but we sure missed you and Laura. Glad you had a good time with your folks. The pictures are adorable! I've already chosen several as wallpaper for my desktop. Sounds like a lot of fun for a two year old. The dress sure is cute! That was one of my favorites!!! I love that Laura can wear it. Can't wait for you guys to come for a visit. It will be a crazy weekend but the girls will have a lot of fun!